4113 Alcoa Road, Benton, Arkansas. There is a sign out front that has the name “Goheen Legal Services.” It is the first building on the right after crossing the railroad tracks on Alcoa - 1.7 miles from the intersection of Smithers and Alcoa Road. There is parking in both the front and the back. The entrance to the quilt room is on the right side when you are facing the building. For several years Sidney Morris has not only been our leader, but has also provided a place for us to make quilts for Arkansas Children’s Hospital, Arkansas Cares, New Beginnings, Safe Haven, Hospice and the VA, to name a few. For more information, Fay Poe wrote an article in the September, 2014, newsletter about what takes place at Sidney’s. She titled it “Kid’s Quilts,” and has included a longer list of recipients. 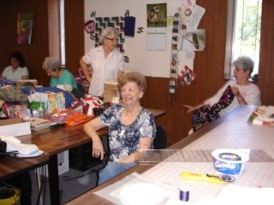 Sidney keeps pictures in a scrapbook at the sewing room of all the quilts we have given away. 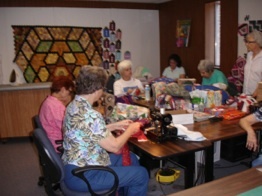 Also, she has a scrapbook with pictures of donation quilts for each year.